^ a b Stiles, D. (1991). ^ Presenter: David Attenborough; Director: Sally Thomson; Producer: Sally Thomson; Executive Producer: Michael Gunton (March 2, 2011). ^ Virah-Sawmy, M.; Willis, K.J. ; Gillson, L. (2010). ^ Perez, V.R. ; Godfrey, L.R. ; Nowak-Kemp, M.; Burney, D.A. ; Ratsimbazafy, J.; Vasey, N. (2005). ^ Butler, Rhett (July 17, 2005). ^ Mutibwa, P.M.; Esoavelomandroso, F.V. (1989). ^ McLean Thompson, Virginia; Adloff, Richard (1965). ^ Andrew, David; Blond, Becca; Parkinson, Tom; Anderson, Aaron (2008). ^ a b Middleton, Karen (1997). ^ a b c Sibree, James (1915). ^ Jacob, Jeanne; Michael, Ashkenazi (2006). ^ Ficarra, Vanessa; Thiam, Aminata; Vololonirina, Dominique (2006). ^ Jeanguyot, Michelle; Ahmadi, Nour (2002). ^ Ranaivoson, Dominique (2007). 100 mots pour comprendre Madagascar (in French). ^ a b Weber, Katharine (2010). ^ Pitcher, Gemma; Wright, Patricia (2004). ^ a b Sandler, Bea (2001). ^ Janick, Jules; Paull, Robert E., eds. (2008). ^ Hubert, Diana (August 3, 2010). ^ Motavalli, Jim (November–December 2007). Auzias, Dominique; Labourdette, Jean-Paul; Mauro, Didier; Raholiarisoa, Emeline (2009) (フランス語). Le Petit Futé Madagascar. Paris: Petit Futé. ISBN 2-7469-2684-9. http://books.google.com/books?id=HIbtI1gayWYC&printsec=frontcover#v=onepage&q&f=false. Blench, Roger (1996). “The Ethnographic Evidence for Long-Distance Contacts Between Oceania and East Africa”. In Reade, Julian. The Indian Ocean in Antiquity. London: British Museum. pp. 417–438. ISBN 0-7103-0435-8. オリジナルの2011年4月25日時点によるアーカイブ。. https://www.webcitation.org/5yDeVpBA4?url=http://www.rogerblench.info/Archaeology%20data/Africa/East%20Africa%20and%20Indonesia%201996.pdf 2010年11月12日閲覧。. Boissard, Pierre (1997) (フランス語). Cuisine Malgache, Cuisine Creole. Antananarivo, Madagascar: Librairie de Tananarive. Bradt, Hilary; Austin, Daniel (2007). Madagascar (9th ed.). Guilford, Connecticut: The Globe Pequot Press Inc. ISBN 978-1-84162-197-5. http://books.google.com/books?id=vyNVb2q0RisC&printsec=frontcover#v=onepage&q&f=false. Bradt, Hilary (2011). Madagascar (10th ed.). Guilford, Connecticut: The Globe Pequot Press Inc. ISBN 978-1-84162-341-2. Campbell, Gwyn (1993). “The Structure of Trade in Madagascar, 1750–1810”. The International Journal of African Historical Studies 26 (1): 111–148. doi:10.2307/219188. Campbell, Gwyn (2005). An economic history of Imperial Madagascar, 1750–1895: the rise and fall of an island empire. London: Cambridge University Press. ISBN 0-521-83935-1. http://books.google.com/books?id=13Yt9jLuKzsC&printsec=frontcover#v=onepage&q&f=false. Chan Tat Chuen, William (2010) (フランス語). Ma Cuisine de Madagascar. Paris: Jean-Paul Rocher Editeur. ISBN 978-2-917411-32-2. Donenfeld, Jill (2007). Mankafy Sakafo:Delicious meals from Madagascar. New York: iUniverse. pp. xix. ISBN 978-0-595-42591-4. Espagne-Ravo, Angéline (1997) (フランス語). 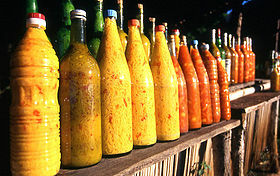 Ma Cuisine Malgache: Karibo Sakafo. Paris: Edisud. ISBN 2-85744-946-1. Faublée, Jacques (1942). 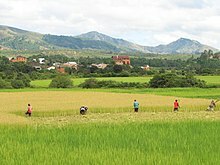 “L'alimentation des Bara (Sud de Madagascar)” (フランス語). Journal de la Société des Africanistes 12 (12): 157–202. doi:10.3406/jafr.1942.2534. オリジナルの2011年4月25日時点によるアーカイブ。. https://www.webcitation.org/5yDebJAig?url=http://legacy.persee.fr/showPage.do?urn=jafr_0037-9166_1942_num_12_1_2534 2011年1月7日閲覧。. Gade, Daniel W. (1996). “Deforestation and its effects in Highland Madagascar”. Mountain Research and Development 16 (2): 101–116. doi:10.2307/3674005. Grandidier, A. (1899) (フランス語). Guide de l’immigrant à Madagascar. Paris: A Colin et cie. http://books.google.com/books?id=ZxbgAAAAMAAJ&printsec=frontcover#v=onepage&q&f=false. Linton, R. (1928). “Culture Areas in Madagascar”. American Anthropologist 30 (3): 363–390. doi:10.1525/aa.1928.30.3.02a00010. Nativel, Didier; Rajaonah, Faranirina (2009) (フランス語). Madagascar revisitée: en voyage avec Françoise Raison-Jourde. Paris: Editions Karthala. ISBN 978-2-8111-0174-9. http://books.google.com/books?id=6NHOFJJHOc0C&printsec=frontcover#v=onepage&q&f=false. Oliver, Samuel Pasfield (1885). The True Story of the French Dispute in Madagascar. London: T.F. Unwin. (フランス語) Savoir Cuisiner: La Cuisine de Madagascar. Saint-Denis, Reunion: Editions Orphie. (2004). ISBN 2-87763-020-X. Sibree, James (1896). Madagascar before the conquest. London: T.F. Unwin. http://books.google.com/books?id=rENCAAAAIAAJ&printsec=frontcover#v=onepage&q&f=false.